If you don’t already know, October is the official month for Breast Cancer Awareness. A lot of companies and organizations hold charity events while everyone wears a pink ribbon or dresses in pink to show support. 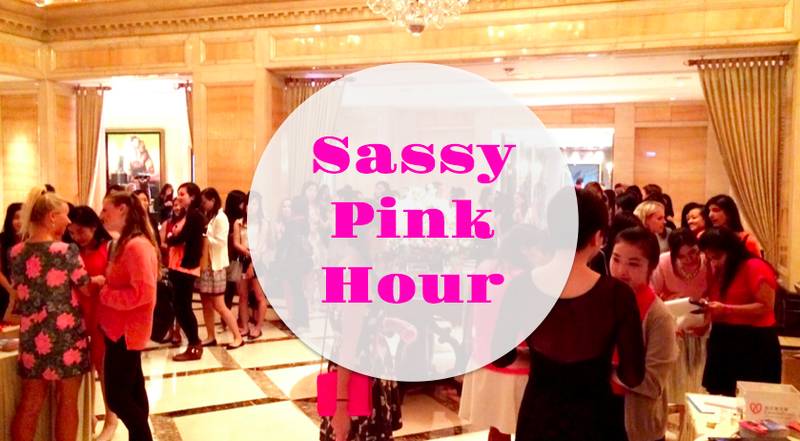 Last night Sassy Hong Kong held a charity event, “Sassy Pink Hour” to support this cause as well. This is the first Sassy event I’ve ever attended even though I’ve been reading their blog since I’ve came to Hong Kong. It was free to attend the event, but there was raffling and the money that went to the raffling tickets were donated to charity. They also had a lot of free (and really girly) activities at the event! The event was scheduled to start at 7pm at the Palm Court at the Langham hotel in Tsim Sha Tsui. It’s basically an opened bar area next to the reception. The hotel’s style is very elegant which completely fits the theme. There was a big display of lilies in the middle of them room and a large chandelier on the high ceiling. Because there was goodie bags handed out to the first 100 girls that showed up and is on the RSVP list, by the time I arrived at 6:45pm there were already almost 100 girls waiting. I’ve never seen so many girls gathered in one room, all dressed in pink! (Everyone wearing pink gets a complimentary Bellini) The whole Sassy team was there as well to take photos, sell raffles and just mingle with everyone. After entering Palm Court, there were 4 different booths where you can receive free services. There was a photo booth from Venture Studios HK, Smokey eye makeup booth from Hollywood Hair, Brow waxing booth from Benefit, and a Manicure Booth from Sense of Touch. I first lined up for the Smokey eye booth since I’ve never really tried a smoky eye. They were very professional and explained everything really well. I’d say the experience was pleasant! But smoky eye isn’t really my style. Different kinds of bite-size snacks were also served, like macaroons! Every time the food came out, it would disappear within 30 seconds. I really wanted to try the manicure booth, but since I already had gel nail on and they wouldn’t be able to remove it, so I went for the to the brow waxing booth to accompany my friends. At around 8:30pm, the raffle winners and Instagram were announced! I’ve never seen such an amazing list of prizes before! They were ranged from HK $500 up to HK $14,000. To name a few, you could win a photo-shoot session, skin care set, makeup brush set, spa package, hair salon voucher, happy hour for 10 at a restaurant, and 6 bottles of sparkling wine! (See the full list here) The raffles were $20 for 1 or $100 for 6, and all the money goes towards Cancer Fund Pink Revolution. Unfortunately I didn’t win, I am really unlucky when it comes to these drawings or raffling things. 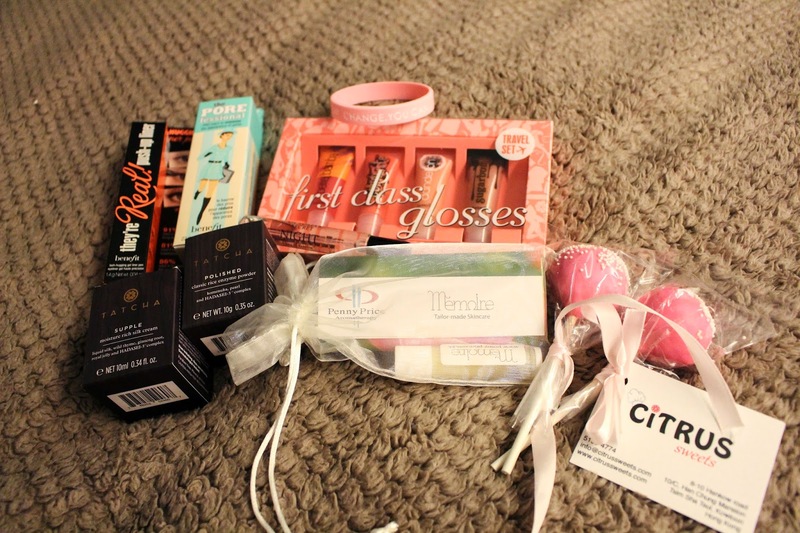 But regardless, it feels good to support charity, and plus I got free drinks, snacks, and a makeover! See here for pictures from the event on Sassy’s Facebook page.